Dragon fruit has properties that are useful to humans, such as balancing blood sugar, protect the health of the oral cavity, preventing colon cancer, lower cholesterol, preventing bleeding and treating complaints whitish. 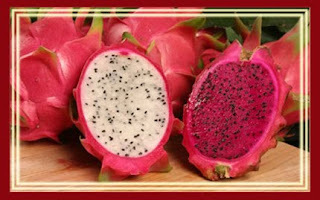 Dragon fruit is usually consumed in the form of fresh fruit as relieving thirst, because the dragon fruit contains high moisture content of about 90% of the weight of the fruit. That's pretty sweet because they contain sugar content reaches 13-18 briks. Dragon fruit can also be expressed in the form of juice, fruit juice, jam or candy and various forms of presentation according to your taste. In general, experts agree to recognize and Dragon fruit is rich in potassium, serum, protein, fiber, sodium and calcium are good for health in comparison with other fruits of import. According to Leong's Johncola Pitaya food R & D, an organization that studies the fruit of the Red Dragon, honey, fruit of cacti is very rich in a variety of vitamins and minerals that help to increase the resistance and beneficial to the metabolism in the human body. "Research shows red dragon fruit is very good for the circulatory system, also gives the effect of reducing the emotional pressures and neutralize toxins in the blood." Research also shows this fruit can prevent colon cancer, in addition to preventing high cholesterol levels in the blood and reduce levels of fat in the body, "he said. In general, each Red Dragon fruit contain adequate protein can increase the metabolism and maintain cardiovascular health, fiber (to prevent colon cancer, diabetes, and diet), carotene (eye health, strengthen the brain and prevent the entry of the disease), calcium (strengthening of the bones). Dragon fruit also contains enough iron to increase the blood, vitamin B1 (prevents body fever), vitamin B2 (add to taste), vitamin B3 (lower cholesterol) and vitamin C (increase slipperiness, smoothness of skin and prevent acne). - Sugar levels: 13-18 briks. - Vitamin C: 9.4 mg.